Can FM8 do funky? Of course it can! This tutorial shows how you can mix a couple of old school ideas together to get something really catchy. Sometimes I like to pick just one element or one idea of a kind of sound to start out a sound design session to see where it leads. With now other mission than to make something fun. Often times it turns into a great sound! So when I sat down to right this lesson, I decide I wanted to fuse two simple ideas together. A classic 8-bit, video game style of synth and some old school funky clav. I figured that if it worked out, it might sound pretty good with a thumping beat and some affected guitar and horns. Beginning with the FM Matrix, of course, I figured that all I really needed to do was beef up an 8-bit sound with some layers, and perhaps some noise. Maybe just a little filter action. Since I didn’t make any adjustments to the individual envelopes for the operators, you can see everything in the main Expert Ops window in the image below. I layered five oscillators and balanced their volume levels as they were routed to the main output. Next I added a little noise from Operator X. Not only did I send it directly to the output, allowing all of the sound to flow through it before leaving FM8, but I also fed it directly into Operator D. After this I felt that a filter was needed. I modulated Operator Z with Operator X and then fed a small amount of that signal back into Operator X to get some feedback presence. Then I sent about have the signal from Operator Z into Operator D. So the only synth oscillator being modulated so far is Operator D.
The next set was to get the effects into this. I really had a specific sound in mind and knew that it would take a lot of shaping, and I used six of FM8’s effects to get there. I added Overdrive, a Tube Amp, a Cabinet, a Talk Wah, some Reverb and the Psyche/Delay. You can see the settings in the image. I a few tweaks on the Master page and we are just about done with the sound. I turned up the voicing to 4 and activated portamento to allow for gliding between notes. And I turned up both the Analog and Digital sliders all the way before I moved on. The last thing to do is get a sequence built in the arpeggiator to make this sound come to life. I chose to keep it rather simple, as the synth has become fairly complex sounding. I loaded the Modernist House preset and then altered it to my needs. Adding a few ties, changed some note orders and transposing a couple steps. I then played C-1, C1, C3 and C5 together and this is what we ended up with. The audio samples are not processed in any way outside of FM8. The first example is just the synth on its own. 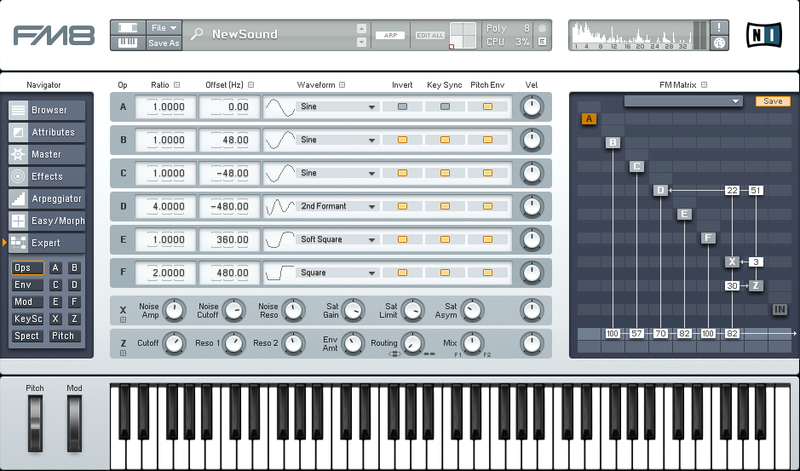 The second is the synth along side a few other instruments to give you an idea of how it sounds in a mix. Fun and funky, this is a great example of how easy FM8 is to work with for making quick, and very unique sounds in just a few minutes. Hope you enjoyed it! Feel free to send us a message requesting a tutorial. We are always happy to hear from our community members. Thanks for stopping by!